Paleontology, as taught in schools and to the general public, sometimes produces images of past realities that are directly related to present places. For instance, an image can title “The Permian fauna of Morocco” and show a gorgonopsian threatening an arganaceras on an idyllic background of fern and early gymnosperms. The problem in this example lies with Morocco. For one, the city of Marrakesh, that provides its toponym, was only founded in the 10th century, and the modern nation-state appears no sooner than after the Independence of 1956. 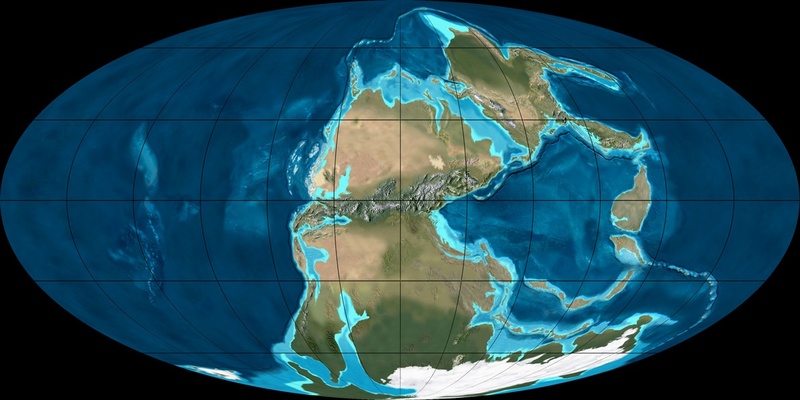 Second, the very ground on which the giant lizards walk was at the time in a very different relation to the seas and continents (Figure 1). To make things more difficult for any attempt of transhistoric localization, the continental plates have since overlapped in many places, turning several locations into one for the zenithal observer. Elsewhere, new surfaces have emerged from the oceans. In short, there is no such thing as a “Permian Morocco” into which we could project our paleontological knowledge. Figure 1 : The Earth in the Early Permian period, Paleozoic Era. Source : Ron Blakey, NAU Geology. “Here” as a work in progress. The example above only exacerbates a recurring challenge facing anyone who tries to localize realities in order to show their spatial relations on a map : the systematic impermanence of any objectivized space. Even at much shorter time scales, constant recalculation is needed to uphold the International Terrestrial Reference System (ITRS) upon which we rely to assign geographical coordinates to all locations on the Earth’s surface (see IERS 2010, chap. 4). The parameters taken into account are physical constants, the relative positions of stars, of artificial satellites, measurements collected by the grids of geodetic control points deployed by a growing number of nations since the 18th century (Figure 2). Any location, any topographical space used as a base layer in thematic maps must thus be thought of as the result of an ongoing production. 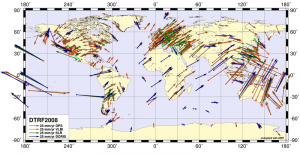 The geodetic “here” results from the synthesis of a plurality of never-ending observations. The concept of “monad” best describes its ontology (see Leibniz 1720). Dennis Oppenheim’s “gallery transplantations” project gives an artistic understanding of this aspect, showing the arbitrary mobility of topographic places (Figure 3). 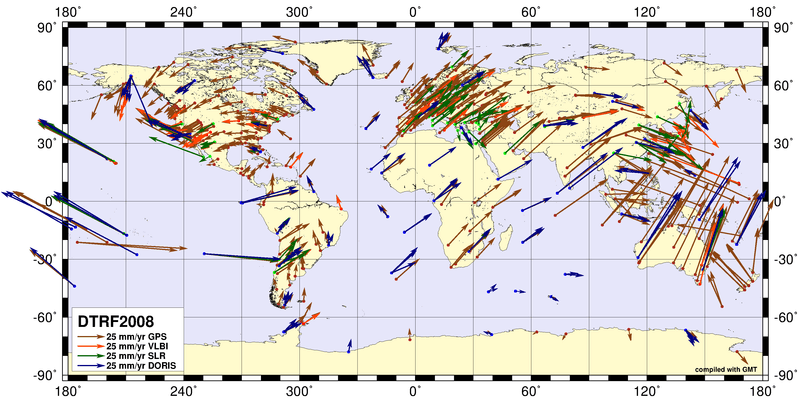 Figure 2 : Positions and horizontal velocities of ITRS stations, realization DTRF2008. Source : DTRF2008. In the realm of toponyms and administrative boundaries, reference spaces evolve incomparably faster. The Swiss thematic cartographer is well acquainted with the difficulties of associating statistical data to base-maps in a country in which multiple communes merge or change their boundaries every year. In the course of mere decades, whole countries sometimes change both in extent and position on the topographic map (see Frank 2012 for example). At the time-scale of the urban world, finally, new buildings, streets, changing traffic rules, emerging public transportation connections, etc. constantly redefine topologies and traveling distances experienced by individual actors. Localized and mobile access-points to the information flow further blur spatial relations. In a novel depicting the life of “traveling streets“ of London, the fiction writer Miéville (2004) gives an evocative metaphor of the troubling process. Now, the geodetic “here” — even if considered as lasting — cannot appropriately contain the urban “here”. The coordinates of the former are a useful reduction in some contexts, but hardly restitute any of the spatial complexity of the latter. Rather, identically to the geodetic “here”, the urban “here” must be understood as a synthesis of a plurality of spatial relations to other urban realities. These relations evolve at urban speed. From this perspective, “here”, understood otherwise than as a fast-exposure snapshot of a given situation, is only an illusion (Figure 4). Moving realities and the phenomenological “here” as a cartographic challenge. Even if we were to pin all places down to a fixed urban fabric, something would still move through them and alter them so much as to make any “same” place incomparable to its own self at different times of the day, week, or season. At different times, different human actors come and go, incarnating habits, odors, modes of expression, buying capabilities, movement velocities and directions, intentions, etc. all of which contribute to what “here” is. In some previous works, I have considered means of integrating those temporal stays of human actors in localized statistical indicators (Ourednik 2012). I would now like to go beyond this conception by proposing a more radical questioning of place and its cartographic representation. Since everything, including places, moves with respect to a constantly evolving reference space, I shall leave behind the distinction between places and moving realities. My working hypothesis consists in taking “here” more strictly for what it is, meaning a point of perspective from which all experience of space is deployed and whose location constantly evolves with respect to other realities1. The challenge for cartography consists in giving access to a space whose base component is no more a presumably fixed place but this phenomenological “here”. The “here”-map as a non-geometric perspective. Some existing maps already give partial answers to this challenge. 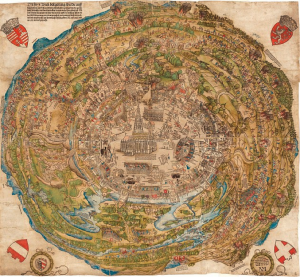 The first I wish to mention is Hans Sebald Beham’s 1529 map of the first siege of Vienna (Figure 4). The document depicts a circular view of the city and its surroundings from an abstract, elevated point of view. As such, its global geometry is simply that of a particular map projection. A closer look, however, reveals rather a circular assembly of elements depicted from a plurality of perspectives : trees, troops, war machines, building facades. All of these highly stylized components contribute to a global vision of the siege over the course of its duration, as understood by the mapper. Its “here” is constructed from his own knowledge of the terrain and of the military events. It is not the result of a unique geometric projection, but of an assembly of knowledge whose perspective resides in its author’s subjectivity. Its synchronicity is not a global one either, but relates to the synchronous conscience of a human individual, composed of his present perception and his memory. Figure 4 : « Belagerung Der Stadt Wien », Hans Sebald Beham, 1529-30. Colored wood engraving, Wien Museum. Source : Dackermann 2011, p. 334. Figure 5 : Nishino, Sohei. 2012. 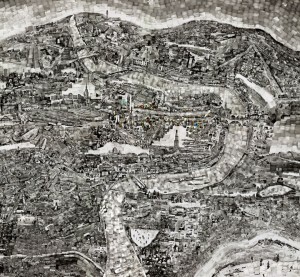 « Diorama Map-Berne » Festival des Arts Visuels de Vevey. A similar example is provided in the “Diorama Maps” of Sohei Nishino (Figure 5). In this case, the map is composed of a series of first-person view photographs. 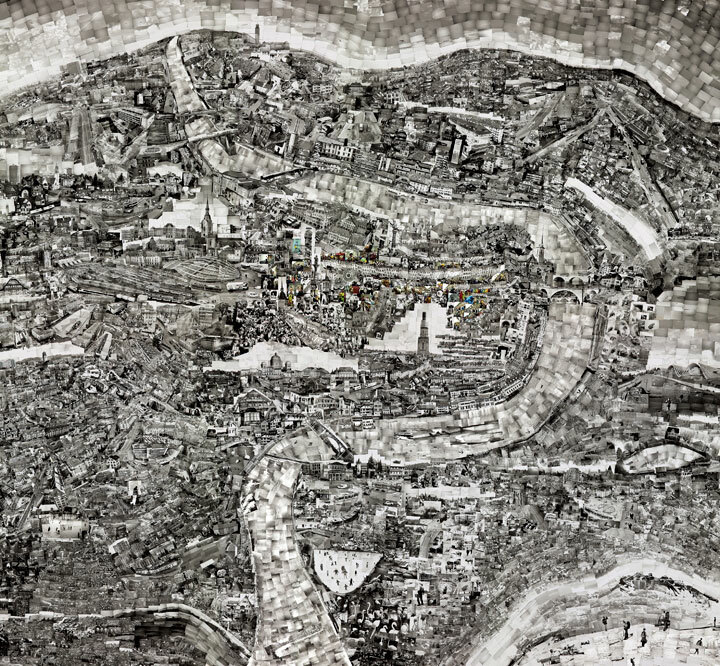 As the artist states, “a Diorama map is anything but an accurate map, it is a trace of the way in which I walked through a town, an embodiment of my awareness, a microcosm of the life and energy that comprises the city” (Nishino 2012). Implicitly however, Nishino’s perspectives are articulated in a similar manner as Beham’s map of Vienna : their assembly order supposes the perspective of an elevated point of observation. Thus, neither map fully escapes the geometric logic of topography. In a previous work, I examined another approach to “here”-mapping : that of augmented reality (AR) (Ourednik 2014). AR, as I have argued, constitutes a special case of a map. It relies on topographic geolocalization systems (notably GPS), but resorts neither to cartographic projection, nor to scaling. Spatial information is, instead, assembled in the current position of the observing actor, and integrated to her experience of space. Different aspects of reality, possibly associated to different historic times, are combined in the hic et nunc of spatial perception. A recent project of the Dutch designer Ilse Heesterbeek, “History Travels With You”, perfectly illustrates this posture : a public bus is equipped with a transparent touch-screen window where texts, graphics, video fragments, and interactive buttons offer riders a chance to learn what happened on the streets that they are driving through (Figure 6). Past and present realities are integrated in the “here” of an individual’s space. Maps conceived from this stance become insights into a liquid urbanity, figures that “do not represent a fixed reality but a current arrangement of virtualities” (Rigal 2013, see Magerand/Montmarais 2003)3. In the perspective of the phenomenological “here”, in effect, the localization purpose of maps should be understood as a “here”-enhancement, both in practical and heuristic terms. The static, zenithal-view map used to be an important instrument of such enhancement. But it is being growingly replaced by mobile devices able to articulate local information (building facades, vehicles, QR tags, etc.) with spatial databases into a new hic et nunc. In a world where even places move, one could argue that such a system gives a more appropriate understanding of the geographical space than any kind of map. Or should our concept of the geographical map evolve so as to refer precisely to this interactive system of spatial information ? Beaude, Boris. 2012. Internet : changer l’espace, changer la société. Limoges : FYP. Beckett, Samuel. 1957. Endgame. London : Faber & Faber. Dackerman, Susan (éd.). 2011. Prints and the pursuit of knowledge in early modern Europe. New Haven : Yale University Press. Deutsches Geodätisches Forschungsinstitut (DGFI). 2012. « DTRF2008, a realization of the ITRS ». Jacobs, Frank. 2012. « 576 - Baltic Ifs and Polish Buts » big think. Smarter. Faster. Leibniz, Gottfried Wilhelm. 1900. La monadologie. Paris : Libriairie Victor Lecoffre. Magerand, Jean et Elizabeth Mortamais. 2003. Vers la cité hypermédiate : du modernisme-fossile à l’hypercité-immédiate. Paris : L’Harmattan. Miéville, China. (2004). « Reports of certain events in London » in Chabon, Michael (éd.). McSweeney’s Enchanted Chamber of Astonishing Stories, p. 241‑262. New York : Vintage. Nishino, Sohei. 2012. « Diorama Map-Berne » Festival des Arts Visuels de Vevey. Ourednik, André. 2012. « Mapping the diachronic reality of the inhabited space on 2d » EspacesTemps.net, Travaux. —. 2014. 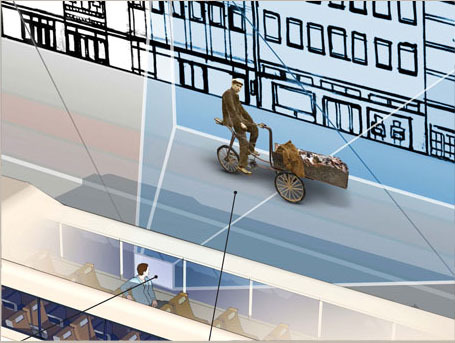 « Augmented Reality and the Places of Dreams » in Chavinier, Elsa et Jacques Lévy (éds.). A cartographic turn. Lausanne : EPFL Press/Routledge. Petit, Gérard et Brian Luzum (éds.). 2010. « IERS Conventions, n° 36 » Frankfurt am Main : Verlag des Bundesamts für Kartographie und Geodäsie. Rigal, Alexandre. 2013. « Concevoir l’urbain en figures » EspacesTemps.net, Laboratoire. Vidal, Philippe. 2013. « Quelle place pour les vieilles cartes au pays des nouvelles technologies ? » EspacesTemps.net, Laboratoire. Waldenfels, Bernhard. 2008. Grenzen der Normalisierung : Studien zur Phänomenologie des Fremden 2. Frankfurt am Main : Suhrkamp. 1 I lean, hereby, on the conceptualization of the incarnate here and now developed in 20th century phenomenology : “Das leibliche Hier und Jetzt, von dem aus ich dir ins Auge schaue, und dich anrede, legt sich wie eine Falte in das dichte Gewebe unserer Erfahrung. Husserl bezeichnet die Ursituation des Hier, die keine bloße Lage (situs) unter anderen darstellt, als ‚Nullpunkt’ der Erfahrung” (Waldenfels 2008, p. 224).